Cape May County Freeholder Jeff Pierson, himself a retired Brig. 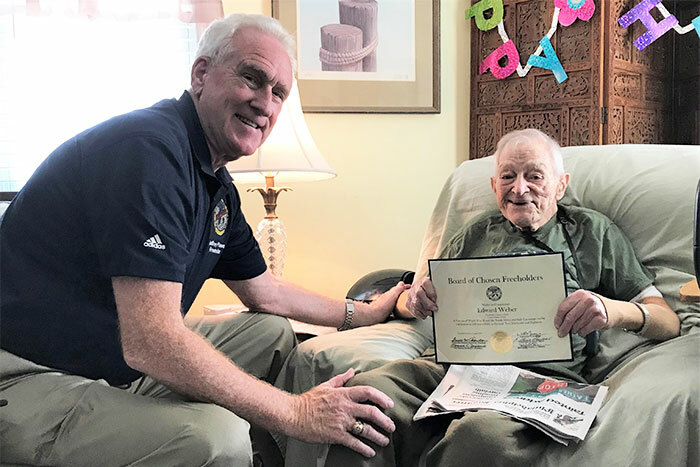 General, presented 100 year old WWII Veteran Edward Weber of Villas with a certificate of congratulations for his years of service to our country. Weber, a Lt. Colonel, served 22 years and 6 weeks from the Army. He saw action in the Italy and African Campaigns where he spent two years. He came home and continued his service in the Army Reserves. He is believed to be the oldest WWII Veteran in Cape May County. Ed Weber is an easy-going, good natured gentleman with a ready laugh. At 100 years old, he just may be the oldest living WWII veteran in Cape May County, but that's not the only thing that makes him special. "I've always been satisfied with my life," he says with a sly grin when asked the secret to his longevity. "There are good and bad points in everything in life. I take it with a grain of salt." So that was true too in 1942 in Illinois when Ed Weber was 24 years old and drafted into the US Army. He was selected for Officers Candidate School. "They called us 90-day wonders," he explained about the time in spent in OCS. "I learned to follow orders and did what they told me to do." After serving two years overseas, Weber returned home but continued his military service in the Army Reserves. "It wasn't my plan, but it became my career," he said adding proudly that he retired with the rank of Lt Colonel after serving 22 years and 6 weeks. "I got to see a lot of things that I wouldn't have otherwise, both good and bad," he recalled of his two years overseas. "We chased the same guy-- Rommel --through Italy and North Africa," he said referring to German WWII Field Marshal Ewin Johannes Eugen Rommel who became legendary as the Desert Fox during the North African Campaign of 1941-43. "They say war is hell… and well, it is." "We enjoy our visits with him and learn something new all the time," said Amber Smith, community liaison with Angelic Health who provides hospice care for Mr. Weber and support for this family. "He is a delight, and we are so fortunate to get to know this special man." As he searches his mind back over nearly eight decades to WWII, the centenarian revealed an incident when Military Intelligence missed the mark. He had only just arrived in Africa when Weber and his battalion where sent out for a surprise attack on the Germans. After painstaking maneuvers to get to the battle location they were shocked to find that the enemy didn't show. "We got there, and nobody was there!" he chortled. "That was a good thing because nobody got hurt." Born and raised in Terre Haute, Indiana he and his wife Marie (who passed in 2001) settled in Pennsylvania. An appliance salesman in Philadelphia, he joined the Army Reserve following his time oversees. Today he lives in the Villas with his daughter Joan Conley and her husband Bobby. Although he stopped playing golf in the early 2000s, he was an avid bowler until four years ago following a bad fall. "He was an excellent bowler," said daughter Joan adding that her father enjoyed his life. "My dad always had a good outlook on life and I think that's why he's still with us today." Because each generation of veterans face unique health issues, Angelic Health is part of the We Honor Veterans initiative of the Department of Veteran Affairs. This program improves the care military veterans receive from hospice and palliative care providers and seeks to ensure that the men and women who have served our country get the care and services they need and deserve. Angelic Health's Vet-to-Vet Volunteer Program matches its hospice patients who are military veterans with volunteers who have also served in the armed forces. "We find that veterans have a unique bond," explained Margie Barham, director of public relations and giving for Angelic Health. "Their experiences, training and deployments connects them in a special way. Both volunteer and patient benefit from conversations and reminiscing. We have many patients like Mr. Weber who would enjoy sharing their stories with a fellow vet." To learn more about Angelic Health's palliative and hospice care services call 609-822-7979, or 609-515-3041 regarding volunteer opportunities, or visit www.Angelic.health.